In any environment: free Wi-Fi available everywhere in the hotel and every suite and room welcomes you with amenities including air conditioning, minibar, safe, satellite TV and automatic alarm clock. Our convenient carpark is also at your disposal. In any nuance of wellbeing: in the Aquadirose Spa and by the swimming pool, allow yourself to be nurtured by pleasure; and in our gym, challenge yourself with a personalised training programme, under the expert guidance of our personal trainers. With all that you require for your business needs: you have fully equipped and modular meeting rooms at your disposal, with the utmost attention to every detail. Breakfast to whom? In fact, judging from all the goodness awaiting guests every morning from 7:30 AM to 10.30 AM … we should find another term to define our breakfast. Top of the podium, perhaps. 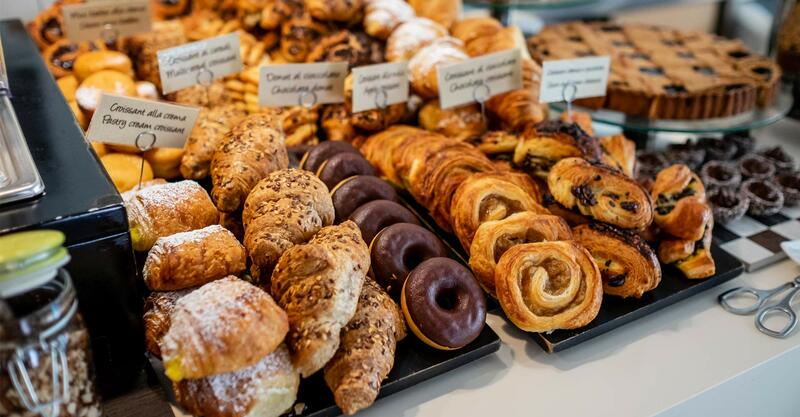 Rich, diverse and delicious: fruit, pastries and savoury dishes, everything truly delectable, genuine and organically sourced as much as possible. A “good-morning” of such calibre, is a promise of a truly “great” day ahead.